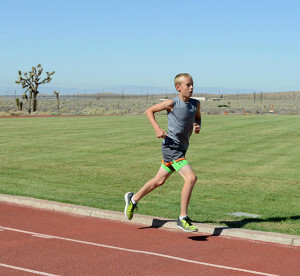 Eleven-year-old Zack Gilbertson completes a lap at the base track July 7 in preparation for an appearance in the 50th Annual USA Track and Field National Junior Olympics Championships, which will be held in Sacramento, Calif., July 25-31, 2016. He is going to compete in the 3000 meter run July 30, 2016. The 2016 Olympics in Brazil is right around the corner beginning Aug. 5. But, before then, the 50th Annual USA Track and Field National Junior Olympics Championships will be held in Sacramento, Calif., July 25 – 31. According to USATF, nearly 70,000 youth athletes compete each year in the Junior Olympic Track & Field and Cross Country programs and many of America’s Olympians began there as youth athletes. One of those young athletes who will compete this year is Branch Elementary’s Zack Gilbertson. Zack, 11, has qualified to compete in the 3,000 meter run at the Junior Olympics. 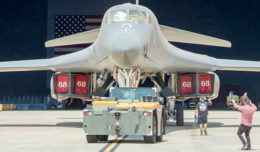 Branch Elementary School is located on Edwards Air Force Base, Calif. Entry for this championship is based on athlete performances at preliminary, association, and regional levels of the 2016 USATF Junior Olympic Program. Competition takes place in two-year age divisions with athletes generally falling between seven and 18. 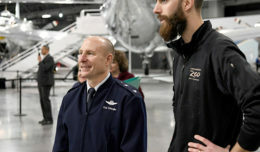 Zack is the son of MSgt. Benjamin Gilbertson, 412th Operations Group first sergeant. His dad said Zack has won several 5K runs here at Edwards including the Reindeer Run last December and the Chief’s Run recently. He will compete in the 11-12 year old category. Eleven-year-old Zack Gilbertson and volunteer coach, Sra. 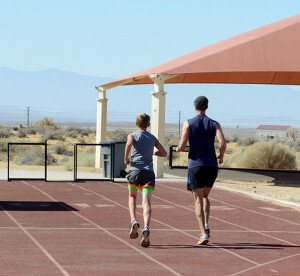 Benjamin Kinley, 412th Maintenance Squadron, head off the track to a running trail July 7. Zack is preparing to compete in the 3000 meter run at the 50th Annual USA Track and Field National Junior Olympics Championships July 30, 2016. Zack’s coach is SrA. Benjamin Kinley of the 412th Aircraft Maintenance Squadron. Kinley is a former college Division II cross country runner and is a certified USATF coach. 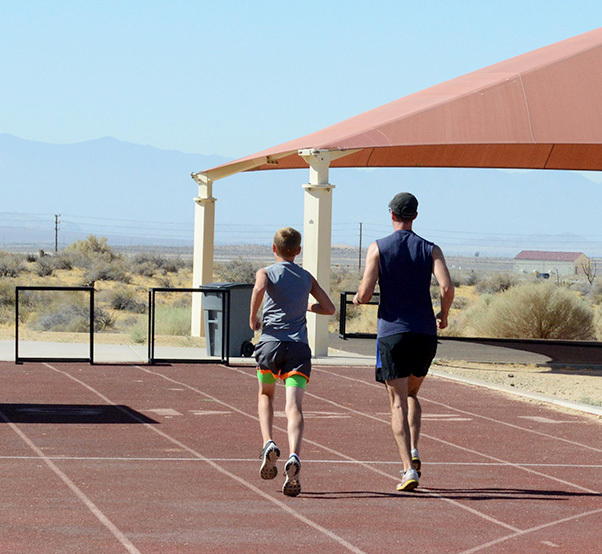 He volunteers coaching cross country at Desert High School along with prepping Zack for the Junior Olympics. The 3,000 meter is a track running event commonly known as the 3K or 3K run, where 7.5 laps are completed around an outdoor 400 meter track. The USATF considers the event a mid-distance run; 3,000 meters equals about 1.864 miles. The world record is 7 minutes and 20.67 seconds set by Daniel Komen of Kenya in 1996. Zack’s big day is scheduled to be July 30. Results will be posted to the USATF website at http://www.usatf.org/Home.aspx. USATF is the national governing body for track and field, long-distance running and race walking in the U.S. The USATF is a volunteer-driven, not-for-profit organization with a staff of professional program administrators at the national office in Indianapolis.